Christmas is coming, Christmas is coming! I love this time of year, but there never seems to be enough time to do all of the things I want to do for Christmas! 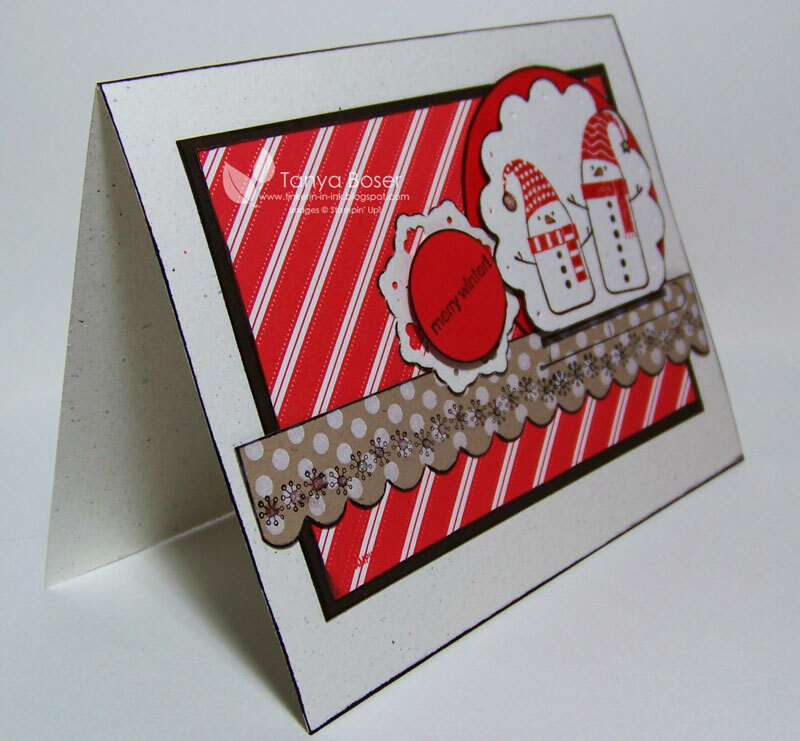 This is the card we made for November club. We will be having club on Thursday this week for December and I can't wait! More fun with the girls!! Love hoe the snowmen sit on the sled! And the polka dots work jsut beautifully on the Crumb Cake strip! 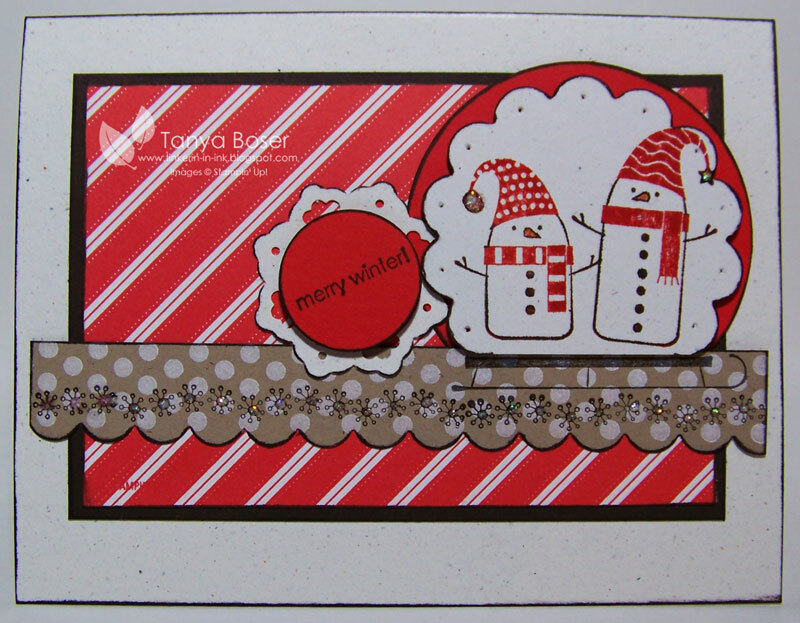 I used the Dazzling Details in the centers of the snowflakes, the buttons on the snowmen, and the dangly ends of the snowmens' hats. And of course, I inked all the edges with an Early Espresso marker! 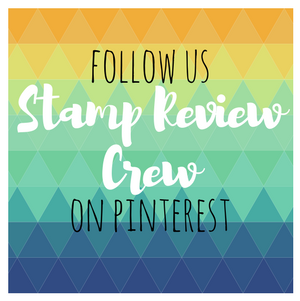 Now, don't forget to come back tomorrow for the UStampwithDawnandFriends Blog Hop. You will not want to miss the fun! 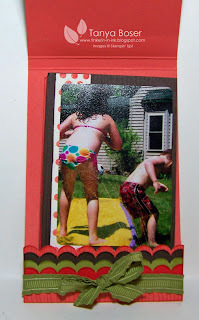 I have a bunch of awesome pictures from a visit with my niece and nephew this summer and I wanted a fun way to share them with their mother. I saw this style mini album on the Workshop Wow DVD I bought at convention this year and it fit the bill. These colors are just perfect for luscious summer memories :) This one is sized for wallet sized photos, but you could really make it any size. Plus, I just used a leftover from a different project to make the main body of this mini album :) The leftover was 3¼"x11"
Score the 11" piece at 4¼", 4½", and 9½". 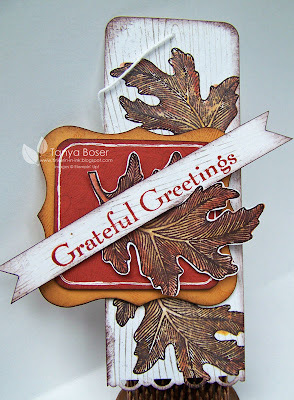 Stamp with the Woodgrain background stamp. Use the Scallop border punch on the the bottom flap and 1" wide x 3¼" long strips of coordinating colors. Adhere strips to flap. Cut a 3"x3½" piece of Early Espresso. Then a 2¾"x3¼" piece of Naturals White. Stamp the white piece as shown. Adhere this to the front of the matchbook, allowing room for the part that will tuck under the flap. Cut a 1-1/8"x2-3/8" piece of Early Espresso and a 15/16"x2-3/16" piece of Naturals White. Punch corners with Corner Rounder punch. Stamp your title on the white piece and adhere to the Espresso piece. Punch out 2 of the 4 petal flowers with the Itty Bitty Shapes punch pack 4 petal flower punch. Set flowers on mat pat foam and push down in the centers with the handle end of your paper piercer to add some dimension, adhere to each other offset. Punch out 2 leaves/branch shapes with the Build A Bird punch, trimming off or not punching out most of the long part of the branch. Adhere to the back of the flower. Apply a Rhinestone to the center of the flower. Adhere to the title piece. Adhere title piece to the mini album cover with Stampin' Dimensionals. Cut out desired number 2¾"x4½" pages, I used 6. Embellish as desired. Fold bottom flap up, insert pages, and tie a ribbon around the flap to secure the flap closed. I then used a little Sticky Strip under the ribbon to ensure it does not slip off. Now you can tuck the cover into the flap! Here are all the pages tucked into the mini album. I call this picture Shake Your Booty!! Fun with the Slip-N-Slide. I did put pictures on both sides of these pages, so there are 12 in this little album. I like it so much, I may have to make one for me! I did have to get 2 of each print, cuz that's how they sell wallet size pics where I get my pics processed. 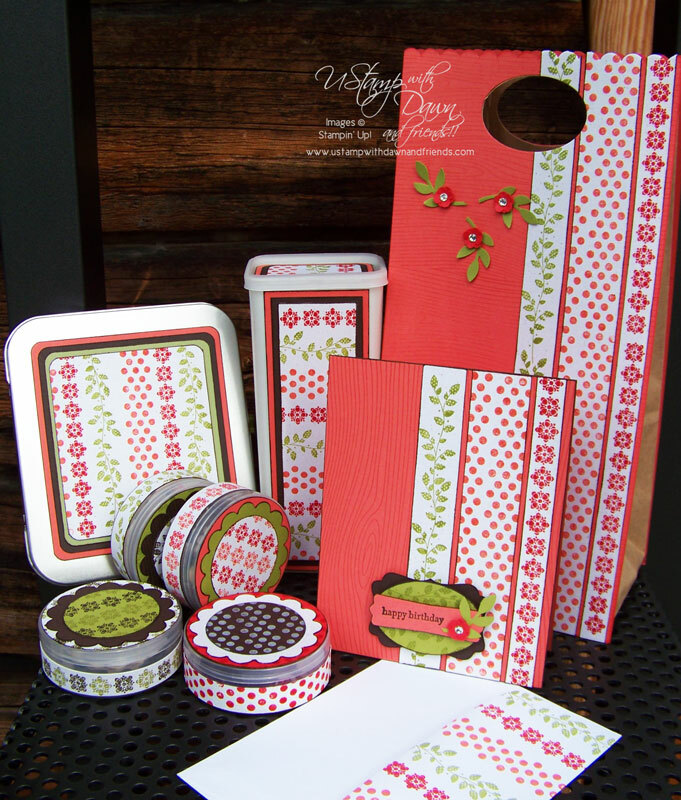 Other: Scallop border punch, Itty Bitty Shapes punch pack, Build A Bird punch, Corner Rounder punch, Mat Stack and Paper Piercer, Lucky Limeade Ruffled ribbon, Basic Jewels Rhinestones, Sticky Strip, Stampin' Dimensionals. I frequently bring stamping supplies with me when we go out of town for the weekend to visit family. I do projects with different family members and I just can't stand to be idle, so it gives me something to do while everyone else is taking naps etc :) But I always want punched shapes and punches take up so much space and weight so much! I came up with this solution. I bring pre-punched shapes in neutrals and the colors I am most likely to use and put them in small containers all ready for me to use! I even recycle by reusing existing containers. And there is a gift bag to put them all in if you want to give these away to a crafty friend. The event this is for is the Knock Out Punches event and it is going full swing right now! My project is being featured today, so if you want the details of how to do it, head on over and get signed up for the Knock Out Punches Event. As promised, another tag! My hubby says this is too detailed to be just a tag, that it should hang on a banner or something, so that you can use it all season. Wasn't that sweet of him?! 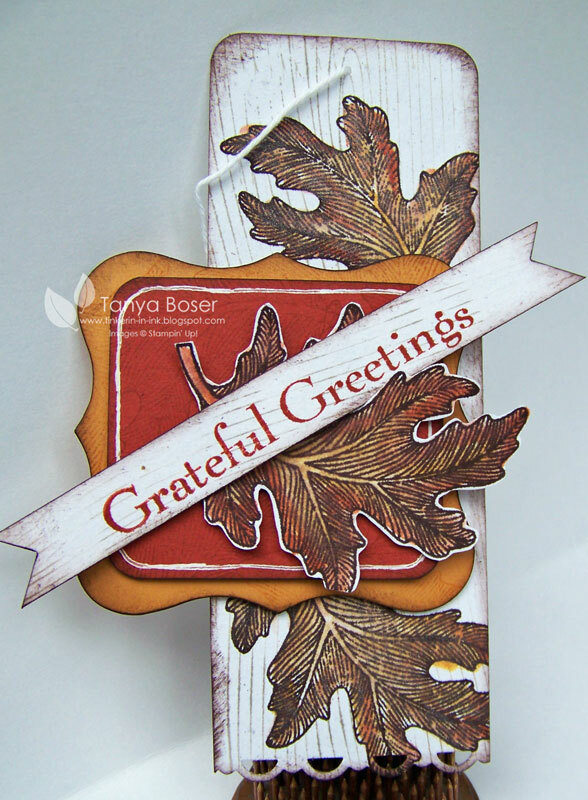 It was another use of scraps from my scrap bins, and I thoroughly enjoyed creating it, even the fussy cutting :) I think if I could get away with it, I would probably use the Woodgrain background stamp on every project I ever create. I just get such a warm cozy feel from it! I live in a log house, we have two woodstoves to heat our home, and I grew up in a woodworking household, so it is "ingrained" in me! Get it? Ingrained! 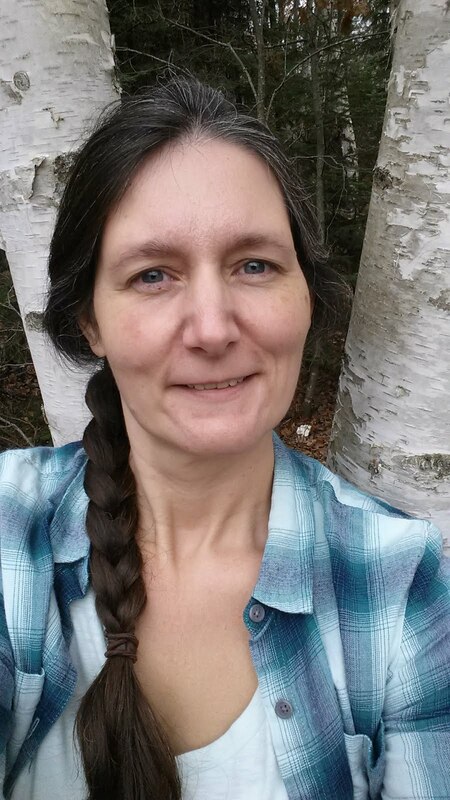 I know, I am so corny, but hey, this is my blog. I can be as corny as I want! The more Mustard shape is actually from the Peekaboo Frames die, and I love that shape. 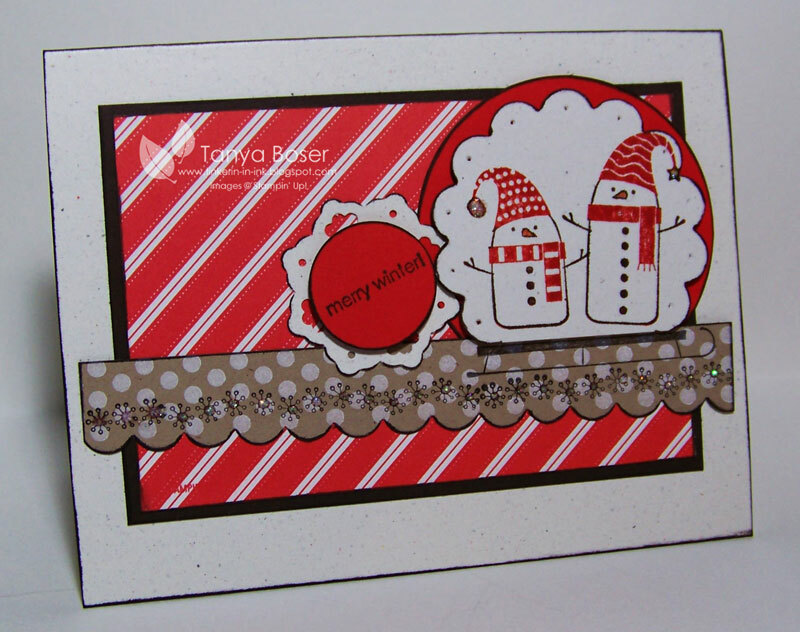 You don't have to use the door :) I am so happy this leaf stamp set made it into the main catty. But I would not be surprised if it retires this year to make room for some other fantastic leaf stamp. 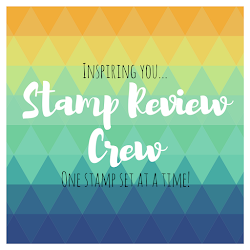 They must know by now that I will buy every leaf and snowflake stamp that Stampin' Up! creates. I just cannot help myself! I used my blender pen to color the leaves with More Mustard and Cajun Craz and there is still a little bit of Champagne Shimmer Paint on my blender pen from a previous use and it added a touch of shimmer to the leaves that is just perfect in its subtlety. I did not manage to catch it with my camera though.